Melanoma metastasis in vivo, visualized using MetAlert mice. 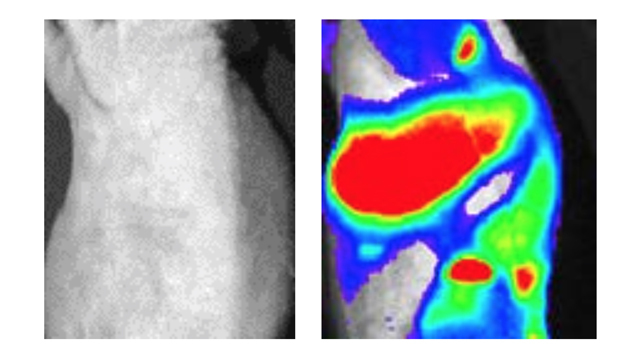 The image on the right is an animal that emits bioluminescence upon the induction of new lymphatic vessels, an early stage in the development of metastasis. On the left is an equivalent animal with non-aggressive melanoma.MARISOL SOENGAS/CNIOMetastasizing cancer cells travel through the lymphatic vasculature, but it’s not clear what role the formation of lymph vessels, called lymphangiogenesis, plays in cancer progression. 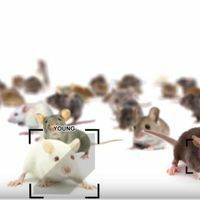 Now, an international team of researchers has used a new mouse model to link lymphangiogenesis to melanoma metastasis. Bioluminescent cells in the animals not only showed where tumors were spreading, but after tumor removal could indicate that cancer recurrence was imminent. Their findings were published today (June 28) in Nature. 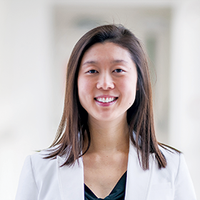 In order to overcome this challenge, Soengas and colleagues decided to track the induction of lymphatic vessel formation—a process known to be activated by melanoma cells. 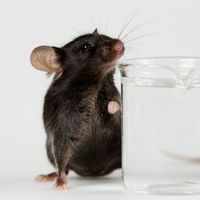 They engineered mice that couple the production of the bioluminescent molecule luciferase to the expression of the vascular endothelial growth factor receptor 3 gene, which is active in developing lymph vessel cells. “At the moment when and where these new vessels have formed, these animals emit light,” says Soengas. 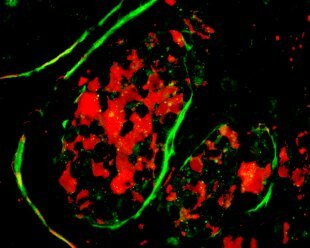 Melanoma cells (red) within lymphatic vessels (green) in a lung metastasis MARISOL SOENGAS/CNIOThe group generated several strains of reporter mice, including one into which they could transplant human melanoma cell lines or human tumor samples and others that developed melanoma due to disrupted tumor suppressors and oncogenes. The researchers visualized the mice and observed varying degrees of lymphangiogenesis. They were surprised to see that lymphatic vessels formed in distant lymph nodes and in the lungs, spleens, and livers of the mice, not just at sites near the primary tumors. When the authors surgically removed the tumors, as clinicians would in human patients, they saw a decrease in lymphangiogenesis, as indicated by a drop in luciferase activity. Luminescence gradually returned after surgery, and shortly after, the tumors also reappeared, which suggests that lymph vessel formation indicates pre-metastatic sites in the mice. The team next compared secreted factors from highly metastatic and less aggressive cell lines and tumors. 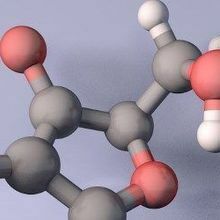 One differentially produced molecule they identified was midkine, a heparin-binding protein that was previously implicated in metastasis in other tumor types. When the authors knocked down the gene for midkine in mice, they saw lower levels of lymphangiogenesis and metastasis. Overexpression of the midkine gene led to high levels of both lymphatic vessel growth and metastases in mouse lymph nodes and lungs. And in human melanoma patients, high midkine levels correlated with greater numbers of metastases and lower survival rates after 10 years. Another open question is, “how distant lymphangiogenesis contributes to metastatic colonization,” Mihaela Skobe, a cancer biologist at Icahn School of Medicine at Mount Sinai in New York City who did not participate in the work, writes in an email to The Scientist. “At this point there is a strong association, but it is not clear how distant lymphangiogenesis preceding metastasis could promote spread” of cancer cells. D. Olmeda et al., “Whole-body imaging of lymphovascular niches identifies pre-metastatic roles of midkine,” Nature, doi:10.1038/nature22977, 2017.